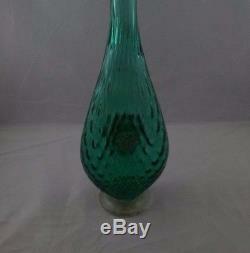 Decanter; Murano Glass, Diamond Pattern, Lion Prunt, Green. 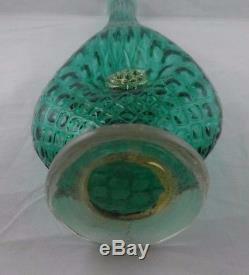 Stunning vintage gold flake Murano optic glass decanter. 17 and 1/2" tall" including the stopper. 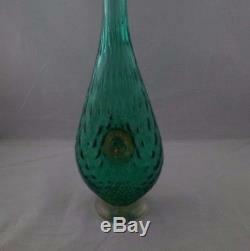 Teardrop shaped cobalt Green with a diamond optic pattern. And flattened sides and pinched in the center. 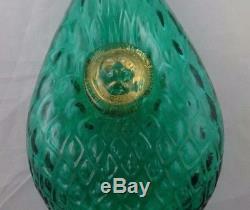 With a large applied gold mica lions head medallion on the front. And a gold mica berry medallion on the back. 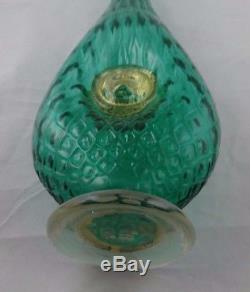 Applied domed crystal foot which is shot through with gold mica. And a diamond quilted crystal stopper with gold mica flecks. 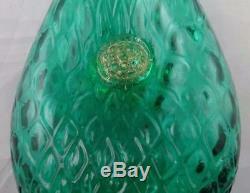 And an applied Green glass ball on the top. 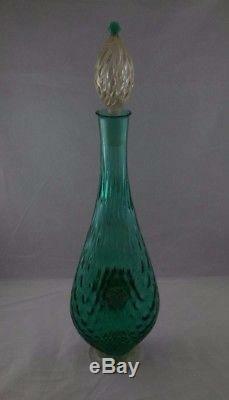 Hand blown Venetian Crystal Made in Murano Italy. Excellent condition: No Chips, Cracks, Repairs or Signs Of Use. 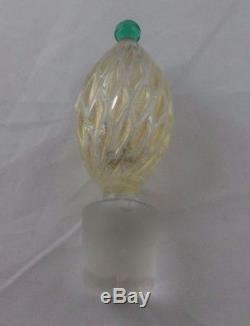 The item "VINTAGE MURANO GLASS DECANTER AND STOPPER WITH APPLIED LION HEAD AND BERRIES" is in sale since Wednesday, December 6, 2017. 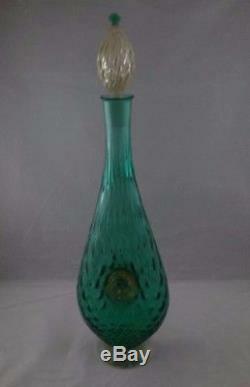 This item is in the category "Pottery & Glass\Glass\Art Glass\Italian".roses" and is located in Rochester, New York. This item can be shipped to United States, Canada, United Kingdom, Denmark, Romania, Slovakia, Bulgaria, Czech republic, Finland, Hungary, Latvia, Lithuania, Malta, Estonia, Australia, Greece, Portugal, Cyprus, Slovenia, Japan, China, Sweden, South Korea, Indonesia, Taiwan, South africa, Thailand, Belgium, France, Hong Kong, Ireland, Netherlands, Poland, Spain, Italy, Germany, Austria, Israel, Mexico, New Zealand, Philippines, Singapore, Switzerland, Norway, Saudi arabia, Ukraine, United arab emirates, Qatar, Kuwait, Bahrain, Croatia, Malaysia, Brazil, Chile, Colombia, Costa rica, Dominican republic, Panama, Trinidad and tobago, Guatemala, El salvador, Honduras, Jamaica, Antigua and barbuda, Aruba, Belize, Dominica, Grenada, Saint kitts and nevis, Saint lucia, Montserrat, Turks and caicos islands, Barbados, Bangladesh, Bermuda, Brunei darussalam, Bolivia, Ecuador, Egypt, French guiana, Guernsey, Gibraltar, Guadeloupe, Iceland, Jersey, Jordan, Cambodia, Cayman islands, Liechtenstein, Sri lanka, Luxembourg, Monaco, Macao, Martinique, Maldives, Nicaragua, Oman, Peru, Pakistan, Paraguay, Reunion.